Beautiful jewelry-quality blue awareness ribbons give purpose to your cause in a subtle yet meaningful way. Hard enamel blue awareness ribbons hand polished to a brilliant luster and smoothness, feature a thin gold outline, clutch backing and measure 1.25" (L) x .75" (W). Please note that this is the non-engraved version of our personalized awareness ribbon pin and that, because the color is identical to the personalized version, you have the flexibility to customize your awareness campaign with two different styles of pins at two different price points. Cause Color: What does a blue awareness pin represent? A blue awareness ribbon represents the universal symbol of support. Sometimes you feel that you want to lend support to a cause, yet you are just not sure how to go about doing that. Do you want to take part in a walk, a demonstration, or a support group? Whatever way makes a difference to you, wearing the awareness ribbon as a gesture of support and respect keeps your cause in the forefront of your mind no matter how you take part in raising awareness. Whether ordering one blue pin for yourself or over one hundred blue awareness pins as fundraising and donor thank you gifts, our ribbon pins are the standout way to call attention to your cause. Start a conversation about causes associated with the color blue such as Arthritis and Bullying Awareness. Support, remember and honor those who struggle or have struggled with a personal health journey by wearing a blue awareness pin on your lapel! Awareness ribbon pins may also be known as badges or awareness badges. 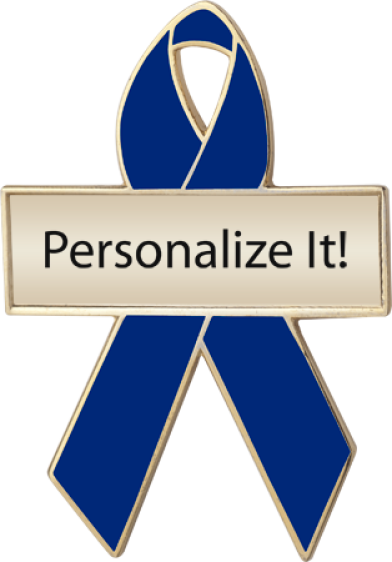 Our blue awareness ribbons are also available in a personalized awareness pin that can be custom engraved with a name, date or message. 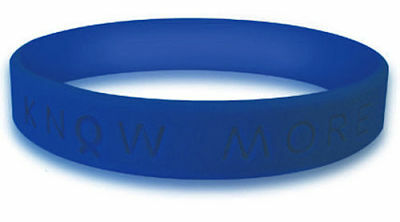 Other blue awareness products include fabric awareness ribbons and blue awareness bracelets.